Pumpkin is a main ingredient in a wide variety of fall desserts, but there are plenty of ways for it to make an appearance at breakfast, as well. Pumpkin pancakes and scones make regular appearances on my fall breakfast table, as does this Pumpkin Coffee Cake with Cinnamon Streusel. 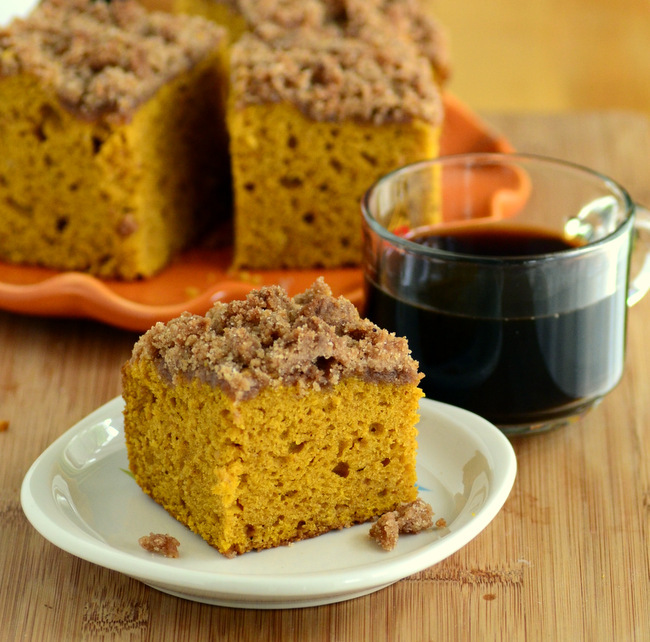 The coffee cake is light and fluffy, yet loaded with pumpkin and pumpkin spice flavor. It’s always a hit and disappears even faster than pumpkin pie in my house. The coffee cake is made in two parts: the cake and the streusel. The cake comes together very quickly and uses a whole can of pumpkin puree. The pumpkin puree actually takes the place of any liquid dairy (where you might use buttermilk or sour cream in another coffee cake recipe) and turns the batter a beautiful orange color. There is a generous amount of pumpkin pie spice in the batter, too. The streusel is made in a second bowl after the cake batter. It comes together even more quickly, since it uses melted butter, and clumps together easily to make a very visually appealing – and very tasty – streusel topping. I only used cinnamon in the streusel because I didn’t want to go crazy with the pumpkin pie spices. The cinnamon in the streusel compliments the cinnamon in the spice mix from the cake, making it stand out without dominating the flavor of the pumpkin itself. The cake has a surprisingly light, tender crumb and contrasts well with the crisp, buttery streusel on top of it. Thanks to the pumpkin puree, the cake is quite moist and keeps very well for a couple of days after baking. While the cake should be cool before you cut into it, I like to warm up the slices for a few seconds in the microwave before serving them. Feel free to mix up up to 1/2 cup of chopped nuts or chopped toffee bits if you want to add some extra textures or flavors to this cake, too. Make the cake batter:Â In a medium bowl, whisk together flour, baking powder, baking soda and salt. In a large bowl, cream together butter and sugar until light and fluffy. Blend in eggs one at a time, followed by vanilla extract and pumpkin pie spice. Stir 1/3 of the flour mixture into the butter mixture, followed by half of the pumpkin puree. Stir in an additional 1/3 of the flour mixture, followed by the rest of the pumpkin. Stir in remaining dry ingredients and mix until no streaks of flour are visible. Pour into prepared pan and spread into an even layer. Set aside while you prepare the streusel. Make the streusel:Â In a large bowl, whisk together flour, sugar, brown sugar, salt and ground cinnamon. Pour in butter and vanilla and, using a fork, stir until the mixture has the consistency of wet sand. Grab the streusel mixture in your hands and squeeze to create clumps of streusel. Sprinkle streusel mixture evenly over the top of the cake batter. Hi! I just made this in a 8×8 pan because it’s all I had….. warning to others, it domes up a LOT and the inside was not fully cooked. Oops! I am currently cooking it longer (under a foil tent because the streusel was burning) but don’t be like me and use a 9×9 or larger!!! !